We like to root for the retail underdog. Don’t get us wrong, we love all things retail, but we appreciate older, outmoded, and visibly dated centers and hold them with special regards. Perhaps it’s our appreciation of retail history, a throwback to our youths, our dislike for retail homogenization, or even something entirely different altogether. Either way, as a result of this appreciation, our next two posts take us to a very typical midwestern town in southern Minnesota. Strategically located at the intersection of two major interstates, 90 and 35, Albert Lea is home to about 18,000 people. This may seem small, Albert Lea’s retail arm extends into a larger trade area encompassing many smaller communities in south central Minnesota and north central Iowa, which is less than 10 miles south of Albert Lea. With that said, however, many people in Albert Lea and the surrounding areas also travel to areas with a wider variety of retail offerings such as the Twin Cities, about 90 miles away, or to closer shopping areas in Austin, Rochester, and Mason City, Iowa. As a result of the relatively large distances to other cities, Albert Lea has above average retail offerings for a city its size, including two enclosed malls on opposing sides of town, Skyline Mall and Northbridge Mall. Yes, there are two enclosed malls for 18,000 people. 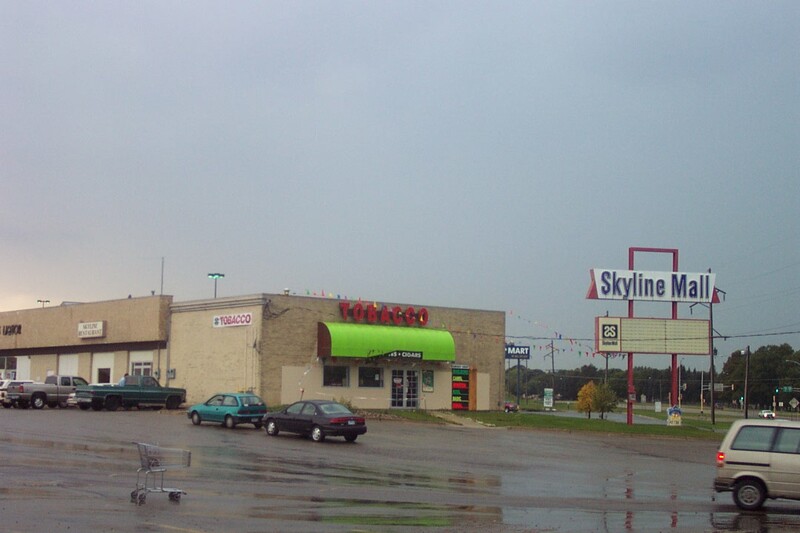 Skyline Mall opened in 1966 on the west side of Albert Lea along Main St. near the intersection with Highways 13 and 69. During Skyline Mall’s heyday, it was anchored by JCPenney on the east side, Montgomery Ward on the west, and an IGA grocery store anchored the north end of the mall. During the 1980s, however, Skyline Mall fell out of favor, possibly as a combined result of increasing competition from distant cities, its age, and changing trends in shopping in general. In 1983, the first blow came as Montgomery Ward closed. 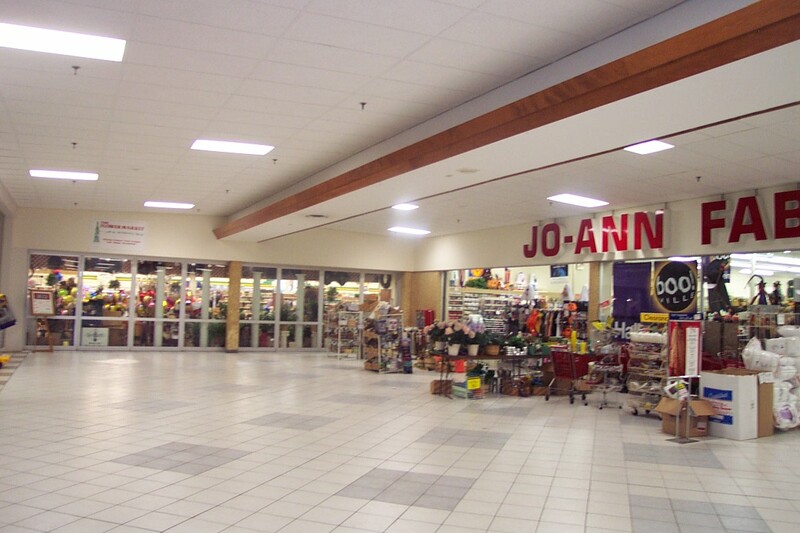 A couple years later, the IGA also closed, leaving two anchors vacant at Skyline Mall. As if that weren’t enough, in 1987 an entirely new mall, Northbridge Mall, was constructed across town. The new mall was modern, larger, and had more features shoppers were beginning to demand such as a food court. In addition, Northbridge is adjacent to an exit from Interstate 90, whereas Skyline Mall is not. Northbridge is also closer to where much of the growth is occurring in Albert Lea, on the east and north edges of town. After Northbridge opened, Skyline continued on and attempted to reposition itself as an ancillary to Northbridge, featuring many local or discount retailers to complement Northbridge’s higher-end and national chain offerings. Indicative of this repositioning was the placement of one of the area’s first Wal-Marts in Skyline Mall, replacing Montgomery Ward as the west anchor. However, it was not enough to sustain the mall and many stores continued to leave. Ben Franklin, Stevenson’s clothing store, and several more stores closed in the early 1990s and finally JCPenney closed in 1993 or 1994, leaving Skyline with just one anchor. The past decade or so has seen Skyline evolve from a retail center into a hybrid enclosed community/office/retail center. The hardware store and several other small shops are still open, but there are also a Senior Center and offices. Wal-Mart has recently left Skyline Mall to build a standalone Supercenter across town, on the east side near Interstate 35. As Skyline Mall continues to soldier on anchorless, it completes the transition from retail to community center and your guess is as good as ours what the future will bring. 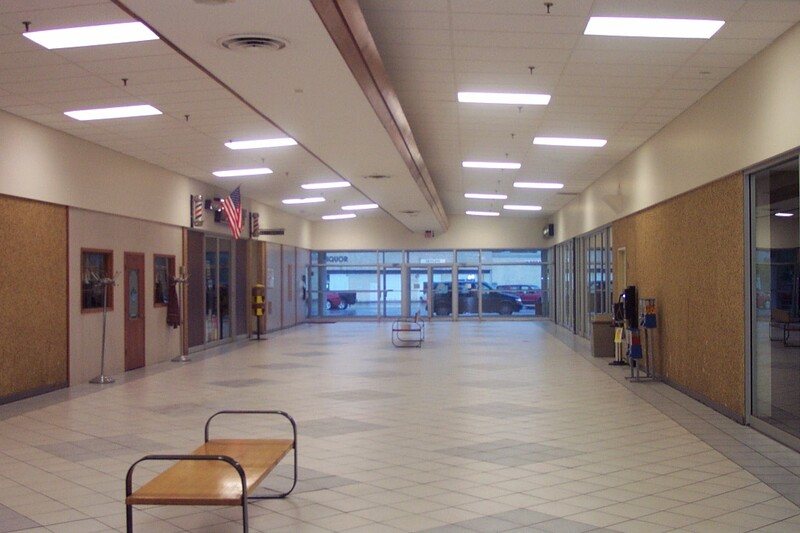 We visited Skyline Mall in Albert Lea in September 2001 and took the photos featured herein. JCPenney had been replaced by Rainbow Foods, but that has since closed. Jo-Ann Fabrics and Hardware Hank are still open as of December 2006. Leave some comments and let us know what you think, and don’t forget to check out the vintage sign. Trouble, trouble, trouble. I like the groovy, minimalist benches. They also don’t look comfortable nor do they say “stay”. This looks like one of those old dying Canadian small-town malls plunked down in the wrong country. JP- You’ll find this a lot in the Upper Midwest. Small malls of this ilk that were built out especially during the late 1960s – early 1980s to supply smaller cities with an enclosed mall of its own, especially considering back then, highway speed limits were lower, thus it took longer to get to large cities where the big malls were, and also as we all know, enclosed malls were all the rage back then, no matter how big or small. Stevenson’s also had stores in Wisconsin. Your date was correct….they went kaput by at least 1991-1992. I forgot what sort of attire they sold…I think women’s apparel. 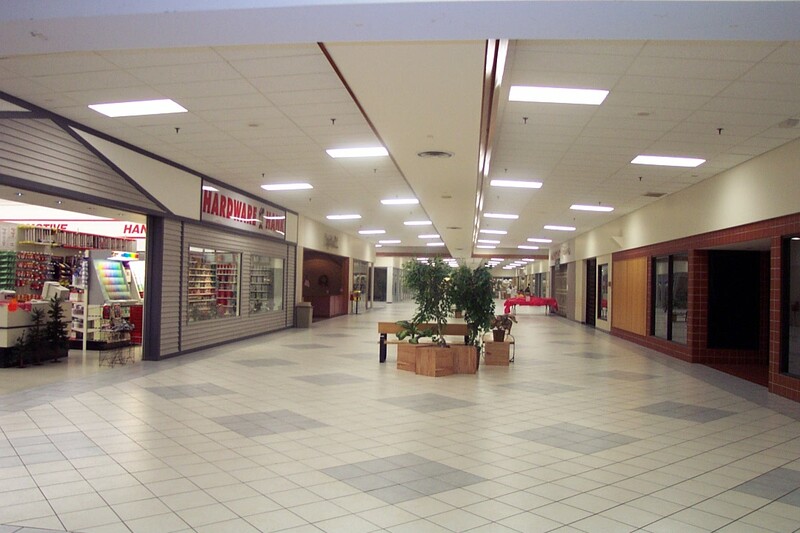 They often located in strip malls or smaller malls like this one, but they had a few larger locations as well. The photos don’t quite tell me about the layout. Was this a straight concourse between the two former anchor stores, or some other design? It’s too bad the mall has more vacancies than businesses within its walls, being that all the big chains want to be where the traffic is. A little plain in design (this was typical for small malls), but it has that certain hint of charm that huge mega-malls just can’t capture. Matt, I’m guessing it was shaped like a plus sign. The layout was a concourse between the two anchors, with a back concourse to the former IGA store which has never been retenanted, to my knowledge. 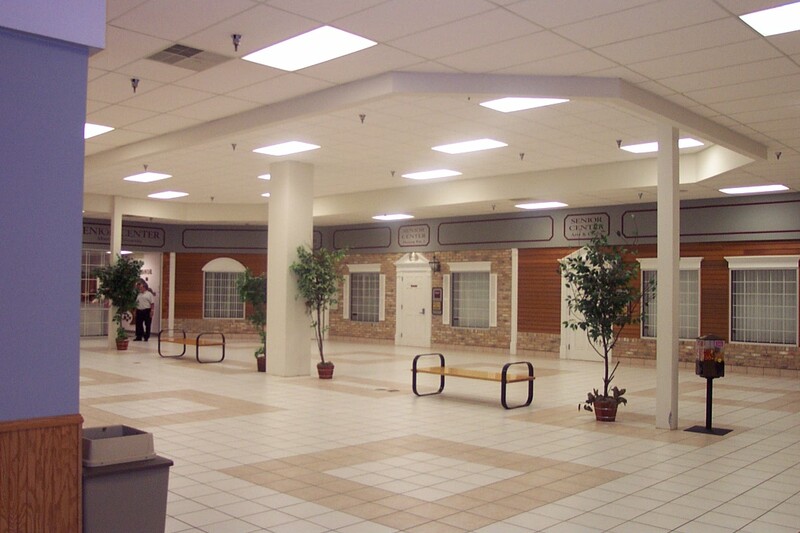 Also, the mall seemed to have been remodelled somewhat (at least the floor and some fixtures) during the past decade, and I’m not quite sure if the office/community space such as the Senior Center took stores or concourse space or both. It’s hard to say. And, we do have a lot of these smaller, almost forgotten enclosed malls in the midwest, especially in smaller cities such as this which are somewhat isolated from larger ones as Matt said. I grew up going to this mall in the mid 80’s-early 90’s. 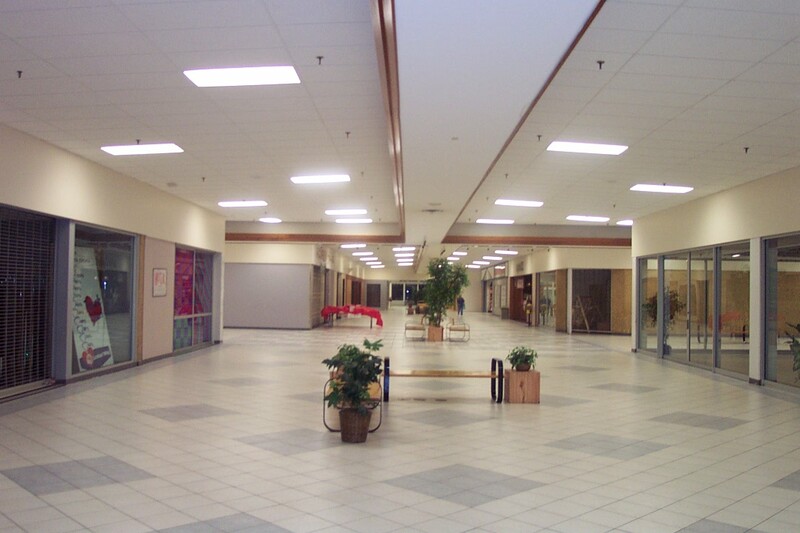 I was really hoping this mall would be pictured at some point on this site because it is what I picture as a “dead mall.” I went back there in summer 2004 for a family reunion (held at the senior center) and was shocked at the difference from what I remembered. I guess Walmart’s leaving really killed this mall. I remember that the JCPenney used to have the old “Penney’s” logo. I was racking my brain trying to come up with the name Stevenson’s (IIRC it was kind of like Maurices). There was also an Osco Drug, a Ben Franklin which later closed and became a party supply store, a fabric store (the JoAnn’s pictured), a western store (the log cabin facade in the 4th picture), a waterbed store, and some other women’s clothing store I vaguely remember my mom shopping at (I’m guessing it was a plus size store). Also I think that the site of the current senior center was the food court or a restaurant. I know there used to be a Dairy Queen adjacent to where the senior center stands. Some remodeling around that area was done, since the senior center area was not previously enclosed. It is on the end of the mall where WalMart was. There was a liquor store in the outparcel. I didn’t get to visit Northbridge mall on that trip. It was built when I was in high school, but even back then it didn’t really have much to offer. Shopko and Herberger’s were the anchors, I remember a Maurices and a big movie theater/food court but other than that it was pretty lifeless even back then. That area close to the interstate has had a decent amount of development in the last 10-15 years. You may be thinking of Spurgeon’s, which was around the corner from Three Sisters. I believe Spurgeon’s sold women’s clothing and maybe kitchen items and gifts, perhaps more. Later, Walmart used those spaces for overstock, which was hauled up and down those ramps at its mall entrance to the old Three Sisters, and outside from the truck bay to a side door near the rear of the former Spurgeon’s on pallet jacks. There was also a bank and Skyline Jewelers near Walmart. After looking more closely at the pictures, Hardware Hank was the site of the old Osco and Ben Franklin was the corner site with the floor to ceiling glass windows on the right in the third picture. The store across the hall from Hardware Hank with the reddish tile was the clothing store I can’t remember the name of. It may have been a local department store? I was very young at the time. The mauve storefront in the background directly next to Hardware Hank was a restaurant. Thanks for the info, Laura. I wouldn’t have figured much of that out without a local perspective. Yeah, kinda looks like this mall wasn’t built to last long. Low roof and no skylights. Looks like a converted office building. In fact, I’d bet a Wal-Mart supercenter could take up the whole building. Very sad to see that the departure of Wal-Mart seems to have almost all but killed this mall(only reason I didn’t say it was completely killed was b/c Jo-Ann Fabrics, and the handful of local businesses(I’ll guess there are a few other local businesses inside, besides just the hardware store) keeping it alive). But hey, looking at all the pics of this mall, and considering that this mall looks like it hasn’t been renovated in ages, I can see why the vacancy rate in this mall has shot above the roof. When i was in elementary school, we participated in a pen-pal program with a school in Albert Lea. As part of our orientation to what their town was like, the school sent us a tourism brochure with pictures of the city. One of the largest ones was a picture of the Penneys in this mall with the old turquoise and black sign. 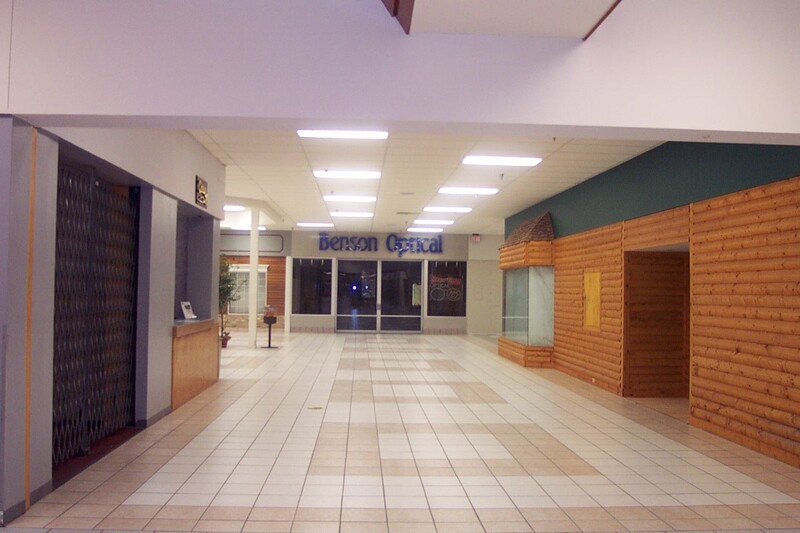 This was before the mall renovated, and it was even more desolate than it looks in these pictures. I think it had conrete floors and there was less lighting, though it had a lot more stores and people. Check out the shot with the mall sign. The standard issue Penneys Auto Center is visble, and still recognizable. Interesting, didn’t realize the building that housed a tobacco/cigarette store on the Skyline Mall sign pic was an old Penney’s Auto Center. I actually remember seeing an old Montgomery Ward Auto Center when I was on vacation in Burlington, IA a few years back, and for some reason, my family happened to drive into the parking lot of the mall in West Burlington(I think it was b/c we got lost in town), and it was one of the very few times I ever saw an older (’70s?) Montgomery Ward logo. I do know that another shopping center(though not an enclosed mall, but an existing outdoor shopping center built in the 1990s) in the Chicagoland area that used to have a Montgomery Ward Auto Center, Village Crossing in Skokie, IL, renovated their auto center building into some sort of rent-a-car place(Enterprise? ), a dry cleaners place, and a Romano’s Macaroni Grill. Though I’m not a big fan of Macaroni Grill, it is sorta interesting in a way that they incorporated the restaurant into that existing building(albeit only reconstructing one side of the building), and didn’t build a whole new outparcel building for it, like what I’ve seen chain restaurants often opt for in other shopping centers. And I greatly stand corrected, btw, about saying Skyline wasn’t renovated!! I’m sure you’re right it was renovated at some point, based on what you described about the flooring of the mall, and the lighting it had in the interior hallways. Sheesh, is the mall owner asleep at the wheel? GET SOME POPULAR TENANTS IN THERE!!!!!!!!! the mall needs to be re-renovated or torn down it’s absolutetly BORING in there!!!!! Keep rainbow foods and the Skyview Mall sign though THAT SIGN SCREAMS 60’s! How about tearing down the vacant Wal-Mart for a start? WalMart uses the old vacant store for storage. one was a small town. It was renovated to be blue. Another one was in somewhere else, and they closed for several years before becoming a Palais Royal and/or a Burke’s Outlet. 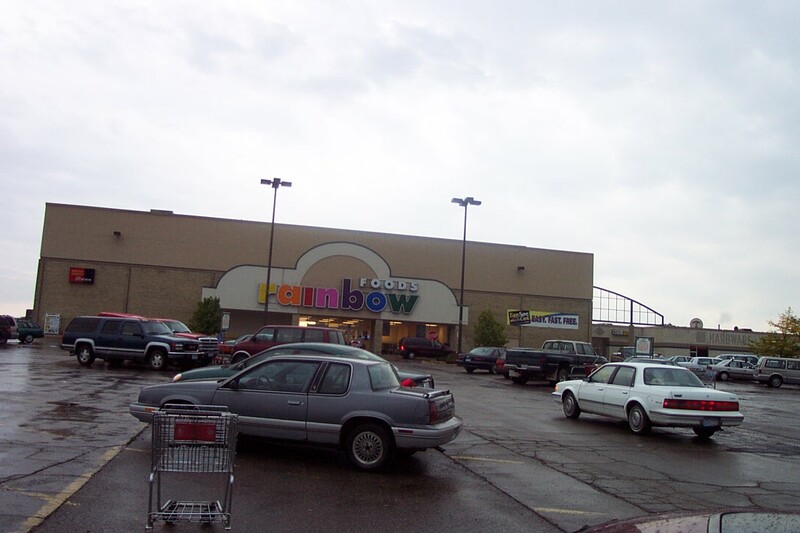 Another was built in 1991 but packed up about 4 years later (one connected to a mall) for a Wal-Mart Supercenter. The abandoned building sat for almost 10 years. Another was brown and is now blue (in my local town). I forgot…so when was this Wal-Mart opened? there was a barber shop and piggly wiggly at this mall in the 1970’s…also at least at that point the ice cream stand was not a dairy queen. in the mid-80’s there was a small bookstore near the ice cream store. i was a big fan of the ben franklin here as a kid in the 70’s. Wow, this brings back so many memories for me. I grew up in Albert Lea and hold many priceless childhood memories dear to me. I can remember back in ’88 and ’89 my best friend and I getting her parents to take us to this mall, (we also visited Northbridge). I can remember just walking around from store to store, buying candy and other unnecessary things. I am a mother now and plan to visit my hometown again very soon, to show my kids where my fondest memories reside. This town has most likely been through enormous change, I haven’t seen it since ’93, but regardless of what’s been taken down or what has been brought in, I will remember it the way it was. A town where life was just a little more simple, a place to make long lasting friendships and even longer lasting memories. and waxing the floor of what would be the Montgomery Ward’s store at the Skyline Mall. This was a few months before the mall opened. The father of a friend of mine in high school was the manager of the ‘Monkey Wards’ store. I grew up going to that mall and thought it was the biggest thing ever. I was in junior high (Southwest) which is walking distance to the Skyline and my friends and I would hang out there all the time. I got caught shoplifting a ‘Hot Wheels’ car there…good memories. I “took” a three ring binder notebook from Ben Franklin. I was so scared walking out of there that I’d get caught I didn’t do that again. I very much enjoyed going to the mall and still do, to get my walking in. They play the old songs continually so that is a plus for me. I actually don’t like Northbridge and it is dead and boring with empty stores in there too. I don’t shop at Wal-Mart since they moved to the East side of town. Just don’t like that store, and I live on the west side near the Skyline. heath is correct, I believe the orginal grocery store was a Piggly Wiggly. I lived in Albert Lea when the mall opened. There was a Three Sisters store (women’s clothing), the restaurant was called Cafe Don L. Right across from the Cafe Hallmark had a store there for awhile, it is now at Northbridge. The Skyline Barbers are still there. JoAnn Fabrics moved to Austin about 3 months ago. There is a business called Etcetera which has children’s clothing and a tanning salon. There is also a Beauty Parlor, Two or three insurance stores, a CPA business, Workforce MN, an orthodontist, the radio stations KATE and ????. A credit Union, a vet, a dance studio for adults, and one for kids, Carhartt is in the Hardware Hank store. There is also a Toy Tractor store where Cafe Don L used to be. A walk through there is a walk down memory lane for the toys, books, and “stuff” in there. The Moose Lodge is now between the mall proper and the County Market grocery store, which is where Penney’s was long ago. Sad to say but Wal-Mart moving across town has hit this mall hard, which is sad…as i much prefered the that one to their new “supercenter”. Jo-Anns has since moved to Austin and there’s very little retail left, the hardware store is the only place still there that I can think of off the top of my head. The cove thing (cant think of any other way to discribe it) with the wood trim running down the center of the concourse has since been torn out…and thus went the last remaining hint of the 60s. The’ve even changed the name to “Skyline Plaza” as it’s more of an office complex then anything else nowadays. It may still be standing but it certainly not a “mall” anymore. 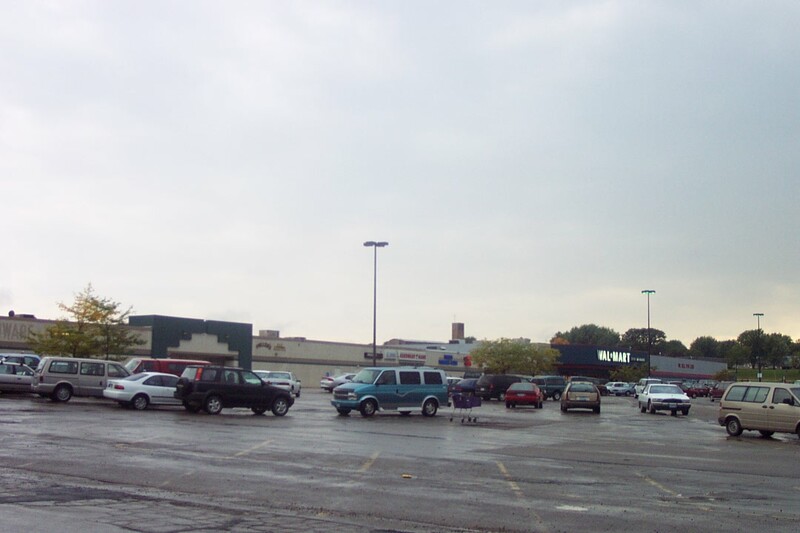 So…I know these pictures are over ten years old, but you never happened to snap a pic of Wal-Mart’s mall entrance, have you?